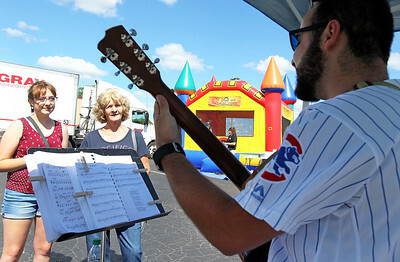 Candace H. Johnson-For Shaw Media Courtney Prais and her grandmother, Jean Yankee, both of Round Lake Heights, listen to Andre Rivera, of Antioch sing jazz and pop songs at the Round Lake Area Chamber Farmers Market in the Eagle Creek Shopping Center (on the corner of Rollins and Cedar Lake Road) in Round Lake Beach. 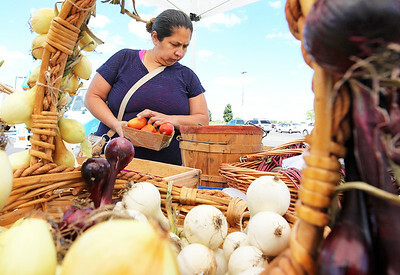 Candace H. Johnson-For Shaw Media Yolanda Palonno, of Round Lake Beach picks out tomatoes for sale by the Maldonado family at the Round Lake Area Chamber Farmers Market in the Eagle Creek Shopping Center (on the corner of Rollins and Cedar Lake Road) in Round Lake Beach. 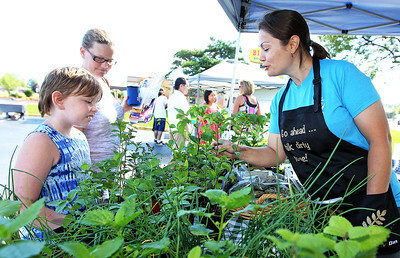 Candace H. Johnson-For Shaw Media Kaitlyn Quint, 10, of Round Lake Beach and her mother, Amanda, talk with Carolina Schottland, of Round Lake, with the Round Lake Area Garden Club about lemon balm and mint plants at the Round Lake Area Chamber Farmers Market in the Eagle Creek Shopping Center (on the corner of Rollins and Cedar Lake Road) in Round Lake Beach. 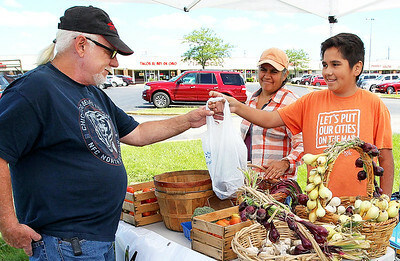 Candace H. Johnson-For Shaw Media Dale Morrissey, of the Round Lake area buys vegetables from Eduviges and her son, George Maldonado, 13, of Round Lake at the Round Lake Area Chamber Farmers Market in the Eagle Creek Shopping Center (on the corner of Rollins and Cedar Lake Road) in Round Lake Beach. The Maldonados grew their vegetables from the Mano a Mano community garden. 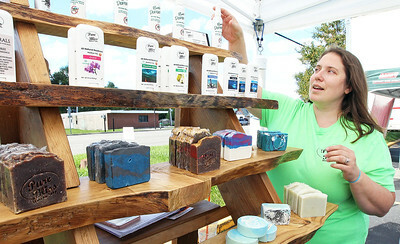 Candace H. Johnson-For Shaw Media Jennifer Gammel, of Lakemoor, with Pure Bliss Artisan Soap, arranges the natural products in her booth at the Round Lake Area Chamber Farmers Market in the Eagle Creek Shopping Center (on the corner of Rollins and Cedar Lake Road) in Round Lake Beach. 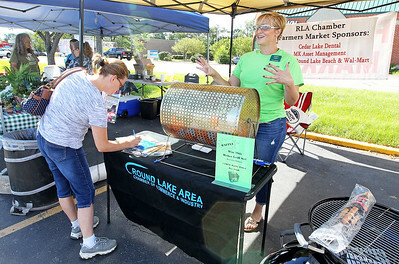 Candace H. Johnson-For Shaw Media Amanda Quint, of Round Lake Beach fills out a raffle ticket to win a Weber Grill as she talks with Casey Torrey, of Volo, President of the Round Lake Area Chamber, at the Round Lake Area Chamber Farmers Market in the Eagle Creek Shopping Center (on the corner of Rollins and Cedar Lake Road) in Round Lake Beach. The grill was donated for the raffle by Wal-Mart. 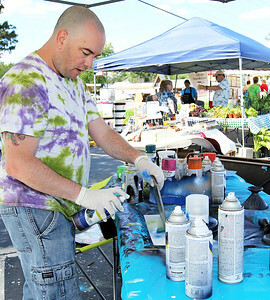 Candace H. Johnson-For Shaw Media Artist Brent Habrych, of Round Lake Park makes a spray painting called, "Full Moon Over Cloudy Waters," at the Round Lake Area Chamber Farmers Market in the Eagle Creek Shopping Center (on the corner of Rollins and Cedar Lake Road) in Round Lake Beach. 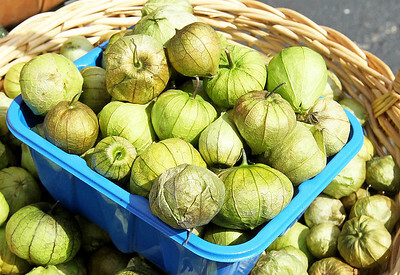 Candace H. Johnson-For Shaw Media Tomatillos were for sale by the Maldonado family at the Round Lake Area Chamber Farmers Market in the Eagle Creek Shopping Center in Round Lake Beach. 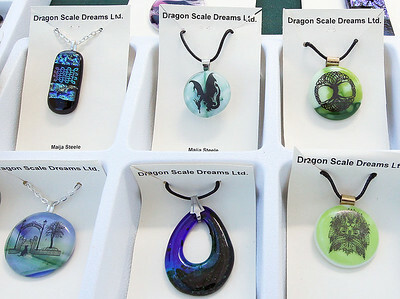 Candace H. Johnson-For Shaw Media Handmade fused glass necklaces by Maija M Steele with Dragon Scale Dreams were for sale at the Round Lake Area Chamber Farmers Market in the Eagle Creek Shopping Center in Round Lake Beach. Candace H. Johnson-For Shaw Media The Round Lake Area Chamber Farmers Market in the Eagle Creek Shopping Center (on the corner of Rollins and Cedar Lake Road) in Round Lake Beach. 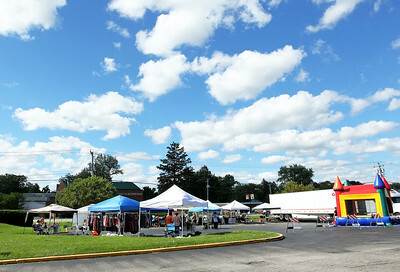 The market will continue to be held on Saturdays from 9-12 pm. through August 12th. Dale Morrissey, of the Round Lake area buys vegetables from Eduviges and her son, George Maldonado, 13, of Round Lake at the Round Lake Area Chamber Farmers Market in the Eagle Creek Shopping Center (on the corner of Rollins and Cedar Lake Road) in Round Lake Beach. The Maldonados grew their vegetables from the Mano a Mano community garden.